Last week I decided to eat only raw foods all week. That’s right, my breakfasts, lunches, dinners and snacks all had to be raw food. I’m very appreciative of this experience for many reasons. First, eating raw foods forced me to delve into fruits and veggies that I would never have thought of cooking with. Secondly, this definitely helped me appreciate the flavors and textures of different types of foods. Thirdly, with all the clean eating, my digestive tract felt great! Lastly, I knew I was giving myself optimal nutrition. Now eating raw foods does not mean eating a bunch of bland fruits and veggies. I was amazed at the flavors that are created when you mix certain foods together, such as raisins and pine nuts, a sweet and nutty flavor. Also, the way the food feels in your mouth is an experience all in itself. You pay more attention to the texture of food and realize how certain foods are crunchy, chewy or soft. 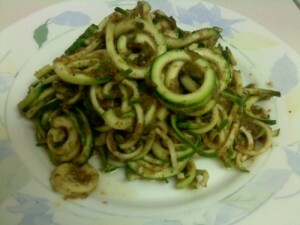 Today, I’d like to share with you my most favorite, and easy raw food recipe: Zucchini Pasta with Basil Sauce. I hope you’ll enjoy this recipe and realize how delicious simple food can be. 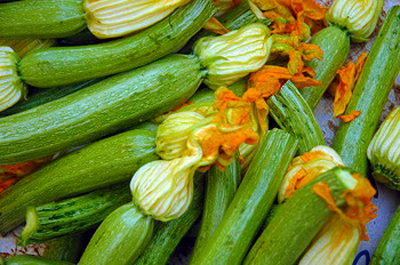 Note: an easy way to julienne zucchini is to take your peeler, and peel thin strips of the zucchini, lengthwise. Stack these strips on top of each other and cut into julienne strips. Blend all of the sauce ingredients in a blender to make sauce. Toss zucchini with pasta. If you would like to have a recipe revamped into something lighter or have any questions, please email Kanwal at kanwal.ullah@gmail.com. Or you can post comments here and she’ll check in from time to time… Or you can always check out her website at AskKanwal.com. You never know, your next question could be featured on next week’s column for The Ajnabee! This entry was posted on Wednesday, January 20th, 2010 at 12:24 am and is filed under Uncategorized.